*UPDATE* - Site servers appear to be having an issue, this went up on numerous blogs today so that's understandable. Ahh, I love choices. And in the area of IM applications BlackBerry devices have no shortage with as the list of IM applications continues to grow. The newest "contender" on the block is FriendplayIM and they bring some neat features to the table that I hope other instant messaging clients will take on in the BlackBerry space. 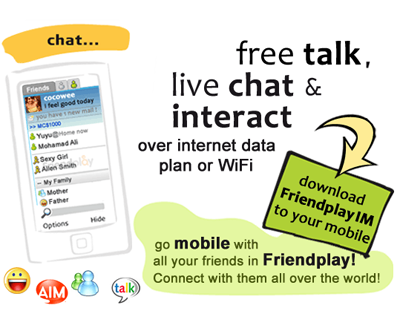 FriendplayIM integrates all your favorite IM services but where the uniqueness of it comes in is that FriendplayIM allows you to create chat rooms as opposed to just chat windows for each individual user. Other cool features include back up services for all your buddy lists and contacts in the case your device might be lost or stolen or damaged, this information is retrievable just by reloading the application back onto your new device.